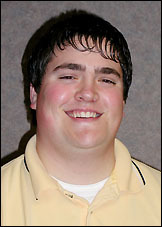 Matt Brauchler, a 2000 PAHS graduate, joined the staff of the Paynesville Area Health Care System in December. As a network administrator, Brauchler is part of a three-person department that supports the computer system throughout PAHCS by maintaining the network, performing computer maintenance, and installing software. Brauchler, who graduated from the University of Minnesota-Moorhead in December with a degree in management information systems, spent two summers interning at PAHCS and was actually offered the position before returning to college last fall. He really enjoyed his time at PAHCS as an intern, he said. He liked the people and the work, and he really looked forward to returning. Brauchler also likes that his job is changing with technology. "I'll pretty much be in school or training forever," he said. Currently, Brauchler lives in Regal with his parents. He's engaged to be married and plans to purchase a house with his fiancee in the area. Away from work, he enjoys outdoor activities, including hunting and snowmobiling.